Here she is so far - "Chickenhawk" author Robert Mason's UH-1D as he flew in the "1st Cav" in Vietnam. I had a great conversation with Bob the other day. And the highlight wasn't about Vietnam. 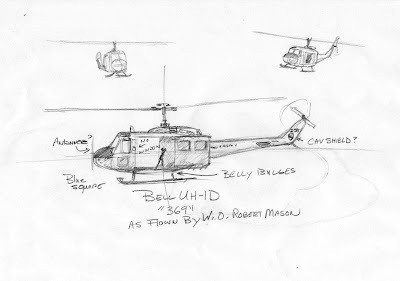 Instead, the most fascinating part of the conversation was Bob's explanation about how helicopters worked and it confirmed what I believed was true; Helicopter pilots have something 'extra' going on in their brains. They have to - rotor-powered flight is that much more complicated than fixed-wing flight. This 'extra' allows Helo pilots to dwell in the abstract just a little bit longer than the rest of us and therefore master this most challenging of processes. In other words, helicopter pilots aren't just bright. They're on it. Until the helicopter either leaves the ground or throws itself into little pieces. And it can happen quickly - tremors, shudders and suddenly, the aircraft is ripping itself apart. Thankfully, Ground Resonance is just a symptom with an easy cure - lift off the ground and cancel the waves. But without knowledge, without fast understanding and without preparation, it's awful. In thinking this strange quirk of physics through, it struck me that there's a parallel between Ground Resonance and how people adjust to stress. The irony of Bob's book, "Chickenhawk" wasn't lost on me either. In essence, the Post Traumatic Stress Syndrome (PTSD) that Bob experienced after his Vietnam service was the flesh & blood version of Ground Resonance. It's easy to teach a do-this, do-that technique to overcome physics, but can you do that with the human mind trying to adjust to the decidedly inhuman act of warfare?? I want Bob to weigh in here...but until then, there are about ten more hours, a few more questions and "369" will be Back in the World. Oh - here's a video on "Ground Resonance." Update time, and here she is so far. 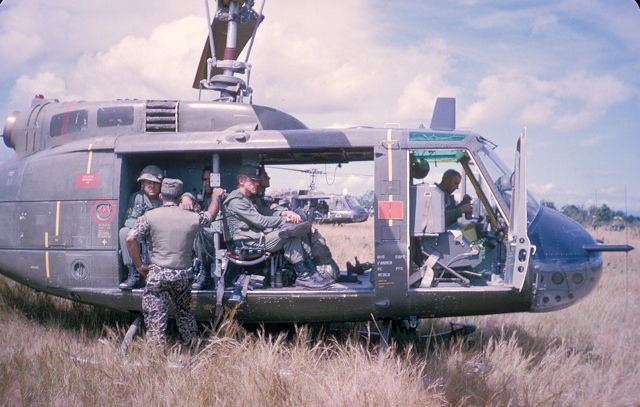 Robert Mason's UH-1D "Slick" as he flew in Vietnam. "...I moved my left hand up and down, twisting it, to control the imaginary Collective and Throttle; my right hand moved in small circles, pretending to control a Cyclic; my feet controlled the Tail Rotor by pumping back and forth. Eventually I could do all these movements simultaneously." Whenever I visualize a fixed-wing airplane, I see simple forward motion. Elegance. The exhilaration of open sky. Freedom. Vistas. But jumping into Bob's Huey, I'm dumbfounded by precarious balance of forces threatening to throw itself apart at any moment. "How is this going to work?!" 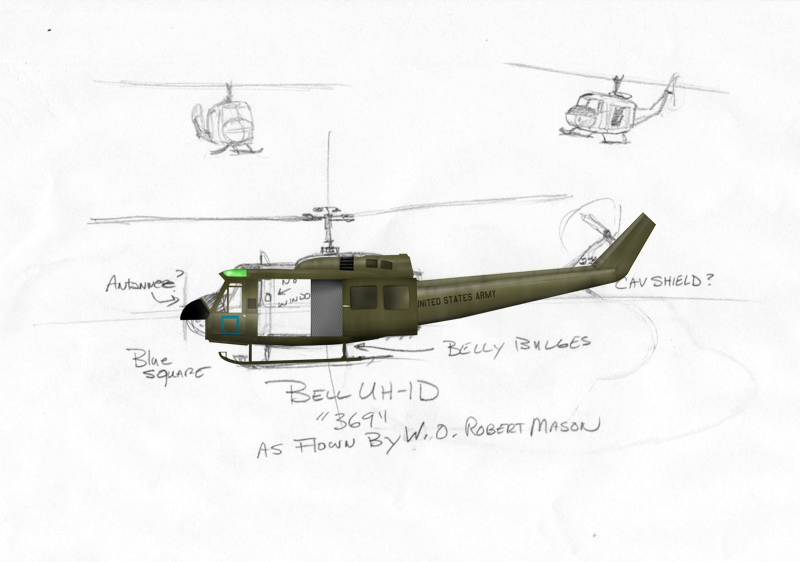 The truth is, however, in spite of a helicopter's complexity and demands, it doesn't throw itself apart. 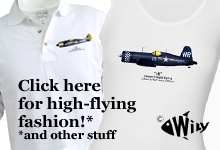 Instead, it flies in a brilliant fashion that makes utter practical sense. Helicopters work fantastically well! Which of course leads us why the UH-1 was so ubiquitous in Vietnam - it was part of the practical plan to create a mobile army that could be picked up and placed at will. The generals hovering over The Big Board could place their chips and markers, confident in the idea that it could be done...and at 125 miles per hour. 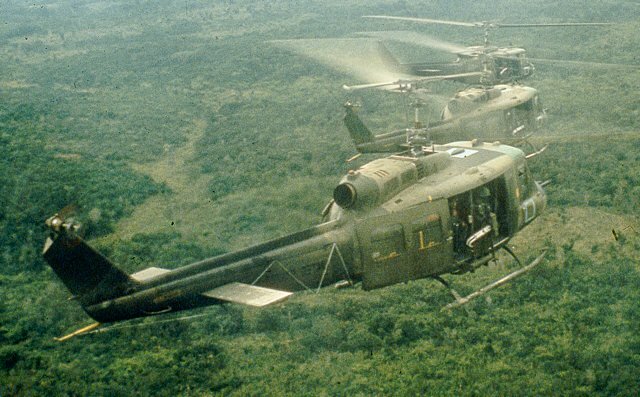 "Whup Whup Whup Whup Whup" Bob and his colleagues would swarm into their "LZs," machine guns rattling, smears of gunsmoke, whirling blades of plant and power...stop, disgorge and get the hell out of there. The mental powers required to control the helicopter, accomplish the mission and suspend a significant portion of reality (i.e. mortal combat) are immense. Bob did it over 1,000 times in Vietnam. Go ahead and say "wow." I know I am - the pressure to make this one perfect is higher than any I've experienced. Here's my pencil-study of the next Profile. How's this for a way to start 2012? When I began interviewing WW2 vets, I never fooled myself that the artwork I'd create as part of the process would become my hallmark. There are only so many hours in a day. The time needed to even approach the level of many aviation artists simply - for me - didn't, doesn't and never will exist. But, the 'story' - the story would require less innate talent on my part and more of the deep well of passion for learning about life through the paths it takes. "The Story" is simply mine to uncover and display. I can do this. Years ago, I was given the book, "Chickenhawk" by a friend who wondered if I'd enjoy learning more of aerial combat in Vietnam. At the time, Hollywood was in full-crank on its fascination with all-things-SE-Asia. Killing Fields, Platoon, Full Metal Jacket...and of course, the fanciful, Apocalypse Now. Truth be told, "Vietnam" was interesting, but at the time, I was hoping more so for a drastic remake of the movie Midway. The dramatic angst of the Era were too closely linked to my mother's television-side rantings against George McGovern and the vibrant images of "Hippies" who slurred their speech and looked so...dirty. I didn't like watching Vietnam on the news, I didn't like hearing about it in the house and given a choice between dreams of blue-nosed P-51s and dingy UH-1s, I'd take the Mustang. Yet, I cracked the book...and finished it the next day in a marathon of page turning. Though Mason's life - in and out of combat - was fascinating in its own right, I remember putting the book down and thinking, "This is how you write!" Damn. It was 20+ years ago that I read Chickenhawk and to this day, it remains in my rarified Gold Standards of the art of truth-telling. Recently, I contacted Robert to do his Vietnam UH-1 "Slick" - not as a vehicle to share history (which it should be obvious that I love doing) but as my way of thanking him for giving me an amazing well to draw upon. Over the next few weeks, I'll be bring one of his Huey's back to life - #369. In the meantime, if you have an appetite for reading, do yourself a favor and get his book. First Air Cav is saddled - let's crank!